I took a copy of this photo in Hertford Museum last year, but there are a few people I can't remember. This is the year group I started off with, so I really ought to remember them, but I had stayed down way back in the 2nd year, so they had been the year above me for about 5 years - that's my excuse! Can anyone (?fra828?) fill in the gaps?
? ?, Anne Lyons (8s), Helen Patmore (4s), ? ?, Sarah Lumb (1s), ? ?, Karen Howes (3s), Kathy Collingwood (8s), Sharon Grant (8s), Clare Watson (5s). Lesley Moore (1s), Valerie Wharton (6s), Hilary Monsell (4s), Miss T, Julia Cleverdon (2s), Susan Lloyd (2s), Jane Parker (1s). Julia Cleverdon was Head Girl and I'm guessing either Hilary Monsell (aka Monster) or Susan Lloyd was deputy. Jane Parker, now Rennie, is on the CHA Board and I've seen her recently. I've also seen Valerie Wharton recently and she looks exactly the same - not a day older than this picture. I saw Kathy Collingwood a few years ago (gosh, actually probably nearly 20 years ago now) as her brother Christopher (also an OB) was rector at St Pauls church in Bedford where my father used to help out in retirement. She came to stay with him, and we went out for a drink. I completely lost touch with Clare Watson, although thanks to Friends Reunited and Facebook I'm in touch with most other 5s in that year (most of whom left at the end of the 5th year). I was also a mon at the time of that photo but was in the LVI - this is UVI only. Whether it really is only mons or all the UVI I'm not sure. Certainly Helen Osborne (5s) is missing but I don't know about anyone else. That photo does bring back memories Jo! I left the year before, and I think Helen Osborne did too (we were friends at school and I am still in touch with her, usually email, tho we did meet up 2 or 3 years ago.) Could the top row far left -wearing glasses- be Linda Bacon ? I cannot recognize anyone else at the moment, will look again next time I'm on this forum and maybe other names will come back to me. I will also ask Ann (Lyon) who I am still good friends with- I see her quite often as she lives nearby. She has a good memory for names and faces! I'm surprised not to see Elaine Hayward (6's and a great friend of Valerie Wharton) - was she not a mon? I believe Elaine may have left at the end of the LVIth, though I wouldn't swear to it. Helen Osborne did stay through the VIth form but she wasn't made a mon immediately at the beginning of the UVIth, even though she and Clare Watson were the only two UVI in 5s. Helen found CH difficult, I think, and was still, even at that stage, running away from time to time. 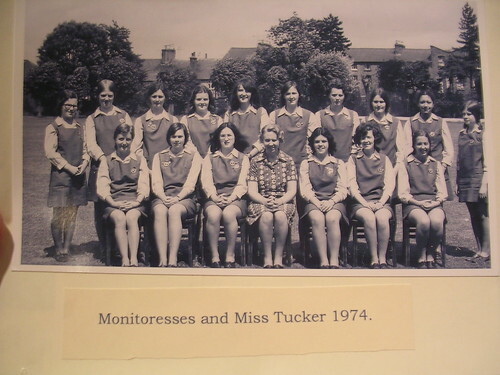 It was because of this that Jane Townsend and I found ourselves in the rather awkward position of being mons at the beginning of our LVI year and technically being senior in status to Helen, even though she was the year above us. I think she got her GA by Christmas though - although that would have been Christmas 1973 and this picture is labelled 1974. However, I know some of the captions in the museum exhibition were slightly inaccurate so maybe this was one of them. The name Linda Bacon rings a bell but I'm picturing a different face. It's probably my memory. Which house was she in? There are no 7s yet identified in the photo. LInda was in 2's with Julia and Susan. Christmas 73 would have made it Summer 1974. Re the photo of 1974 mons:Â Reckon the missing 3 are : from top leftÂ : (Don't think it's Linda Bacon after all !) Hilary Wheatley (7's),Â Â Lindsay Wakefield (7's)Â and Caroline Collins (3's).Â Â Â Yes, I think Elaine A did leave the previous year. There are a few others I can think of that aren't in this photo such as Joanna Robson (5's) and Charlotte Hughes (3's) and Susan Hitchens (7's). Thank you, thank you !!! I'm sure you're right. Hilary Wheatley rings a bell, and the second one does look like Lindsay Wakefield, though I didn't think so at first. And Caroline Collins - yes, for some reason I'd forgotten the name, but now you've mentioned it, I remember her. Perhaps I thought she was in a different year. Jo Robson left at the end of the 5th year. I thought Charlotte Hughes did too, but actually I remember her doing prep in the library so she must have stayed on. Not sure about Susan Hitchins. But this photo was mons only, so maybe they hadn't got their GAs yet. Glad to be able to help out! I think alot of our year, both A and B forms- left at the end of 5th form - some, such as Sue Kirkup did A levels at other schools or colleges - don't know if that was because DR was retiring, or maybe they just wanted their freedom after 5years!! I know that's how I felt when I left in LV1. Free at last from those , by now, very petty rules and restrictions- I remember sitting on the train as it pulled out of Hertford East and the first thing I did was have a cigarette, simply because it was strictly forbidden at school! (didn't stop us having a crafty smoke now and again tho did it?) I did find it hard to adjust to college 'in the outside world' though - as I know was the same for many others on this forum, especially the Hertford OG's. fra828 wrote: Glad to be able to help out! I think alot of our year, both A and B forms- left at the end of 5th form - some, such as Sue Kirkup did A levels at other schools or colleges - don't know if that was because DR was retiring, or maybe they just wanted their freedom after 5years!! I know that's how I felt when I left in LV1. Free at last from those , by now, very petty rules and restrictions- I remember sitting on the train as it pulled out of Hertford East and the first thing I did was have a cigarette, simply because it was strictly forbidden at school! (didn't stop us having a crafty smoke now and again tho did it?) I did find it hard to adjust to college 'in the outside world' though - as I know was the same for many others on this forum, especially the Hertford OG's. That is the understatement of the century!! rofl I went to Imperial college in the Fall after leaving CH. At that time, there were 3 main colleges within Imperial; The Royal School of Mines (99.9% male), The Royal School of Engineering (92% male) and The Royal College of Science (75% male). As if this was insufficient distraction - there was the Union Bar etc. The thing that I really couldn't handle, though - was the freedom and lack of accountability for my whereabouts. No one cared where I was or whether I attended class etc. Hello??? I was so used to complete order and predictability (I'm eating cornflakes - it must be Tuesday, etc) that this really threw me for a loop for a long time. I was immature, unworldly, VERY LOST and - owing to multiple circumstances (both environmental and self-induced) I really floundered for a few years.